Nationally recognized experts Tara Delaney, OTR/L and Mary Hamrick, CCC-SLP have designed this revolutionary workbook to help professionals use the sensory system to teach complex social skills and build self-awareness in children with autism, sensory processing disorder and learning disabilities. This new framework for developing a dynamic social skills program using the sensory system is a way to explore why kids react the way they do socially. With this framework in mind, professionals can build on children’s self-awareness and social acumen. Tara Delaney, MS, OTR/L is a pediatric occupational therapist who has worked with children for more than 20 years. Tara regularly conducts seminars nationally and internationally on sensory integration, child development, Autism and behavioral issues. 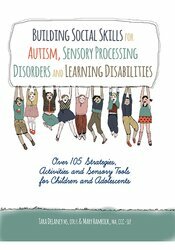 Tara is the author of the best-selling The Sensory Processing Answer Book (Sourcebooks) and 101 Games and Activities for Children with Autism, Asperger’s and Sensory Processing Disorders (McGraw-Hill). Mary C. Hamrick, MA, CCC-SLP, is a nationally recognized speaker in the area of Speech and Language Development and Disorders, Specific Learning Disabilities, and Social Intelligence — specifically how sensory processing impacts social development. CE Credit is not available for this product. Your satisfaction is our goal and our guarantee. Concerns should be addressed to PESI Rehab, P.O. Box 1000, Eau Claire, WI 54702-1000 or call (800) 844-8260.